Now that the pattern + supplies have been ordered/purchased, and maybe even a little cutting and fusing has been completed, let’s get to the fun stuff: SEWING. Ziggi eases you into the sewing process nice and easy with the collar construction, You’ve made a million or two collars, right? 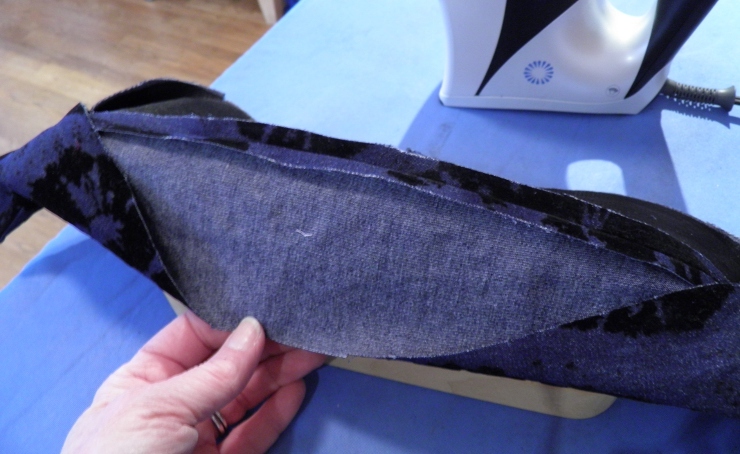 Let me know at the end of this post if you learned a new trick or two tho, because there are some tips here that might make your collar-making pain-free. Start off by trimming your under collar on all sides EXCEPT the neck edge. How much, you ask? I can’t tell you exactly because it depends on the thickness of the fabric you are using, but I can tell you how you can figure it out. You need to cut off the amount that your fabric “uses up” laying across another layer of the same fabric.This is what is meant by the expression “turn of cloth”. 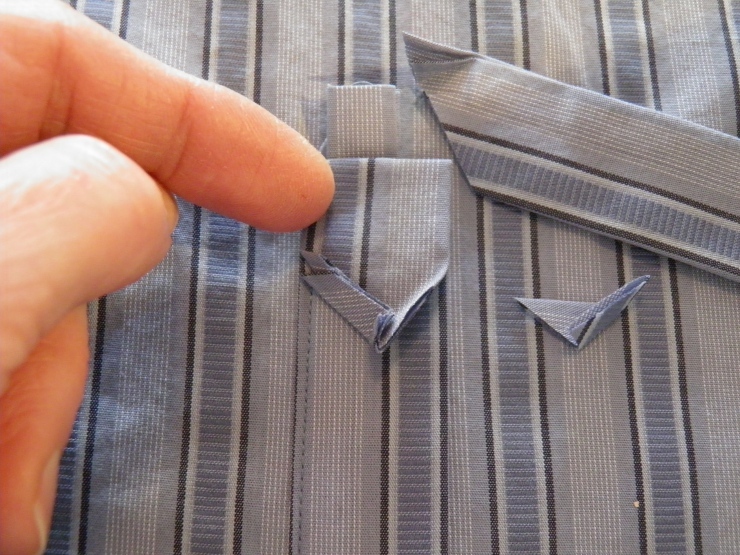 So lay your two collar pieces together, and then fold them in half. In these pictures I am just using samples, but you get the idea. The next step is pinning. With the upper collar on the bottom and under collar on top, pin around the 2 short sides and the collar edge, leaving the neck edge free. Don’t stretch the under collar to fit, but do make sure all end points match. Stitch with the upper collar against your feed dogs, which will ease the upper collar to fit smoothly. Be sure to use a 1/4″ SA! You might not be used to such a small SA, but I guarantee you will come to love it. It is so much smarter to use the SA required for the job: no more, no less. This method eliminates most trimming after stitching, which saves time. And who doesn’t like to eliminate unnecessary tasks? 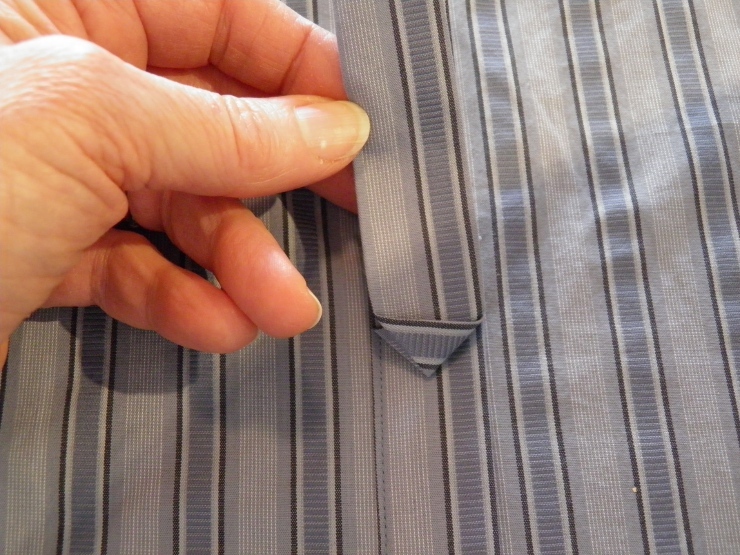 Trim the excess fabric from both collar points, leaving a scant 1/8″ at the tips. If your fabric is a loose weave don’t trim quite so close. 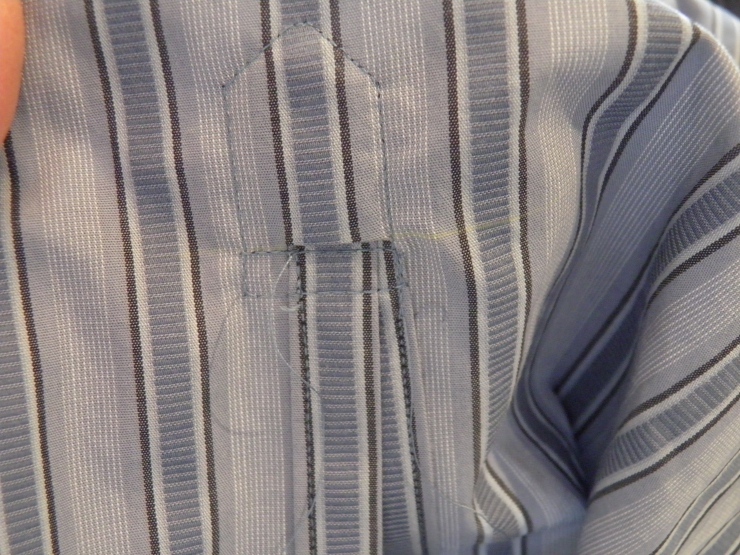 Next, press your stitched collar seams open over a point presser and turn the collar right side out. Your collar points will probably need a little love to get them looking their best. 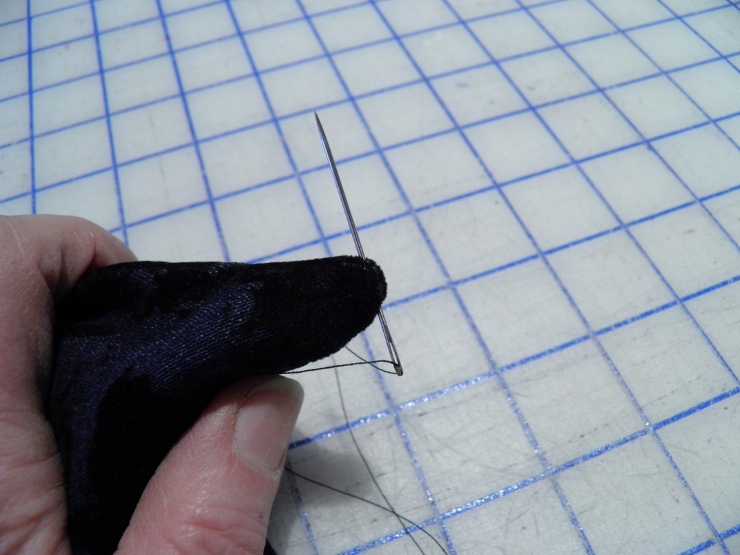 One trick I use often is to insert a threaded needle into one side and out the other of the collar point. The idea is to get the needle right into the seamline on both sides if you can. Pull on the thread, trying to work the point outward as much as possible You likely will need to repeat this same process a few times to pull as much bulk as possible out of the collar point. Don’t try for a perfect point; it is just not gonna happen. Some amount of that collar point bulk is going to stay bunched up in there, so be Zen about it. The thicker your fabric the less “perfect” the points will be. The idea is to just pull as much out as you can, OK? Don’t make yourself crazy! Now just press your collar, admire your handiwork, and be proud your collar is DONE! You feel better already, don’t you? 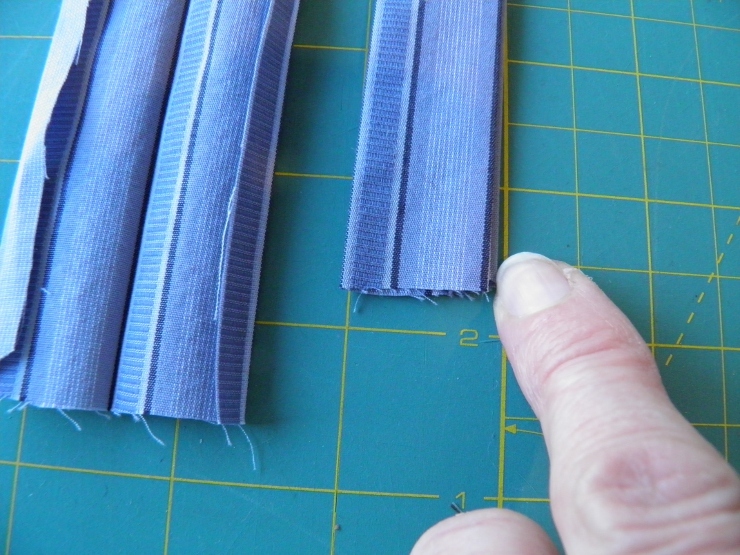 Pre-cut strips of interfacing so they are ready-to-go when you need them. I love having some on hand for zipper insertions and other things. It really stabilizes the stitching line so the fabric doesn’t ripple on top of the zipper tape. 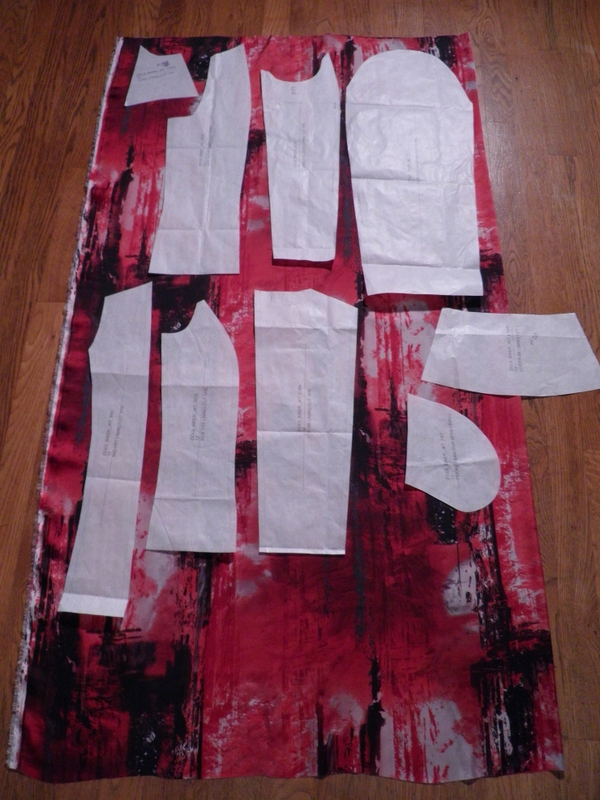 What do you use your interfacing scraps for? 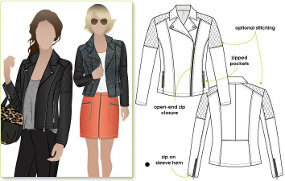 Are you excited to get started on your Ziggi jacket? I am amped like I’ve had 6 double shots of espresso, and hopefully my stitching will not be affected by my crazed condition. Let’s do this, people! 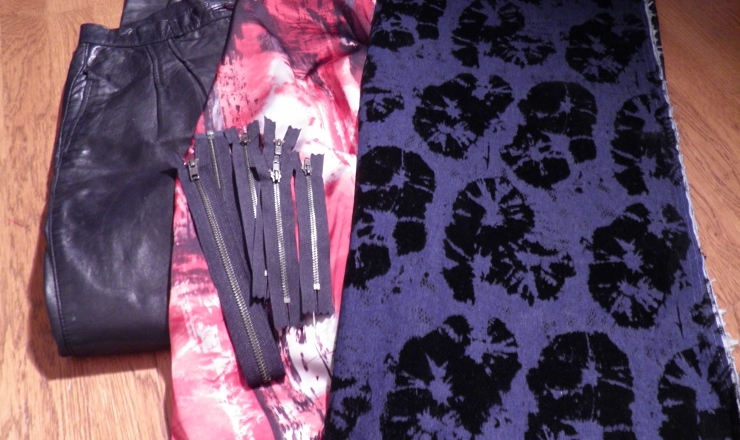 I bought the amoeba-flocked denim at Billie’s Designer Fabrics in Chehalis last fall. Love.This.Fabric. The crazy red print lining is from District Fabrics in Fremont. Thanks Ashley, it is perfect! The custom-length, badass antique nickel zips are from ZipperStop. Kickin’ fast shipping, just in case you need it. 😉 The leather pants have never been worn by me. I bought them from a consignment store for almost nothing because the leather was in great shape. I thought they would make great welts in bound buttonholes, but evidently they want to be something a little racier. Like accents on a Ziggi! Now, some of you lovelies have been concerned about making a muslin first. Two words: YOUR CALL. If you have never sewn a Style Arc pattern and don’t know how they fit your body, it wouldn’t be a bad idea. 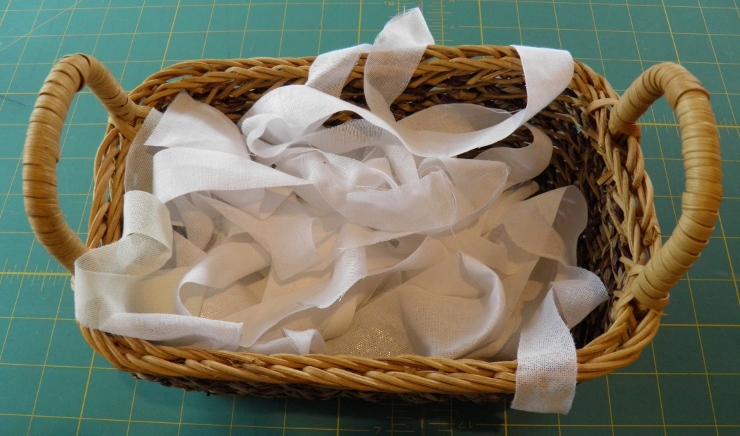 If you want to make a muslin, skip to the Muslin Making section for more deets. If you are good to go, start your engines! Here is the bad news – at least for my pattern. The pattern numbers are not listed correctly on the paper pattern pieces. Bummer. But it only took me about 3 1/2 minutes to go thru the pattern piece list + diagram and write the correct pattern piece number on my pattern pieces. I will write Style Arc and tell them about this, but it is hardly a showstopper. Actually, not even a blip on my sewing radar. 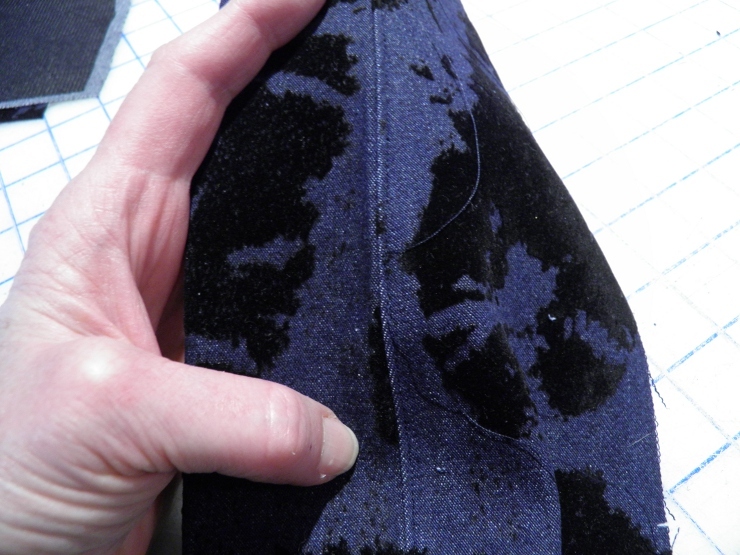 You’re all smart, so I know you pre-washed your fabric if you are using something like denim or twill. If you are using leather, remember NO IRONING. What a relief, right? 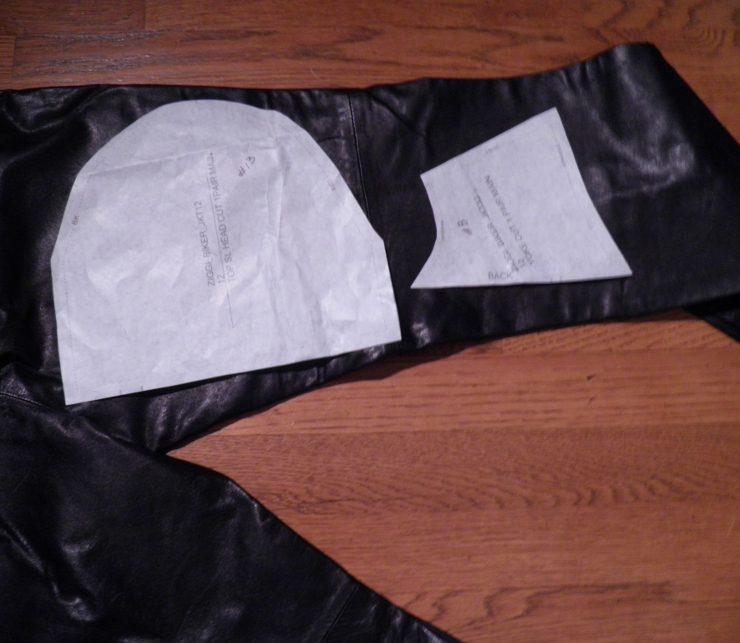 And did I mention how happy I am that I only have to fuse my interfacing to the collar and front facing? Fusing is among my least favorite sewing tasks, so the fewer the better as far as I am concerned. Now, about my leather. I plan to quilt my pieces so I am going to get all my stitching done before I do the final cutting. I bet you know all about that shrinking/quilting thing, so ‘nuf said. If you decide to make a muslin before cutting into your fabric, you should be cutting out everything EXCEPT the pocket facings, the hem facing, the front facing, and all of the lining pieces. Be sure to use a fabric that is a comparable weight to the final fabric you intend to use. WATCH THOSE SEAM ALLOWANCES when you baste it together (yes, I did say BASTE). 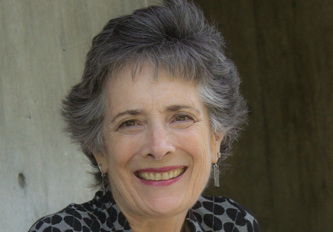 Style Arc uses 3/8″ SA in most places, and 1/4″ on collars. You will LOVE sewing with these seam allowances because the pattern fits together perfectly, and there is NO trimming. Because the pattern piece has the seam allowance required to do the job. No more. No less. Stitch around the outside edges of all hems and outer edges and cut off the SA so you can tell exactly where things will end. Draw horizontal and vertical balance lines on the muslin with a sharpie to help you understand where any fitting issues are occurring. We don’t really have time to go thru a complete fitting in this sew along, since each of you will have different issues. 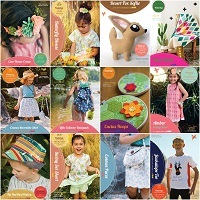 If you are looking for a good, visual resource I really like Sarah Veblen’s The Complete Photo Guide to Perfect Fitting. 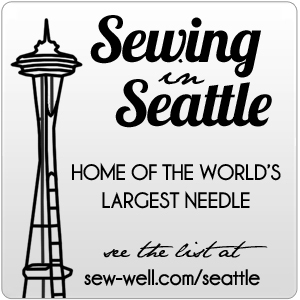 Have you ever wondered what sew camp looks like around here? 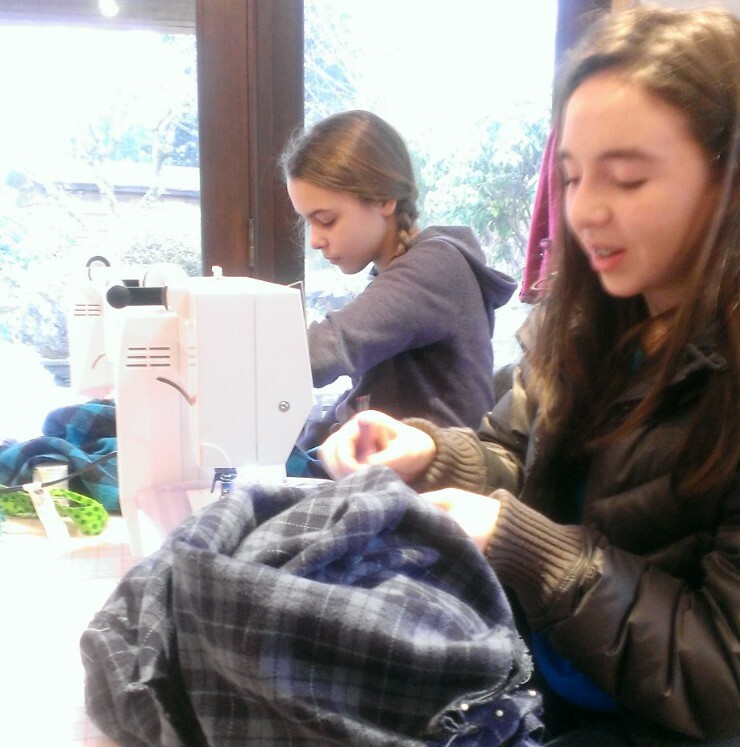 Lots of giggling, lots of sewing, and plenty of girl chatter. 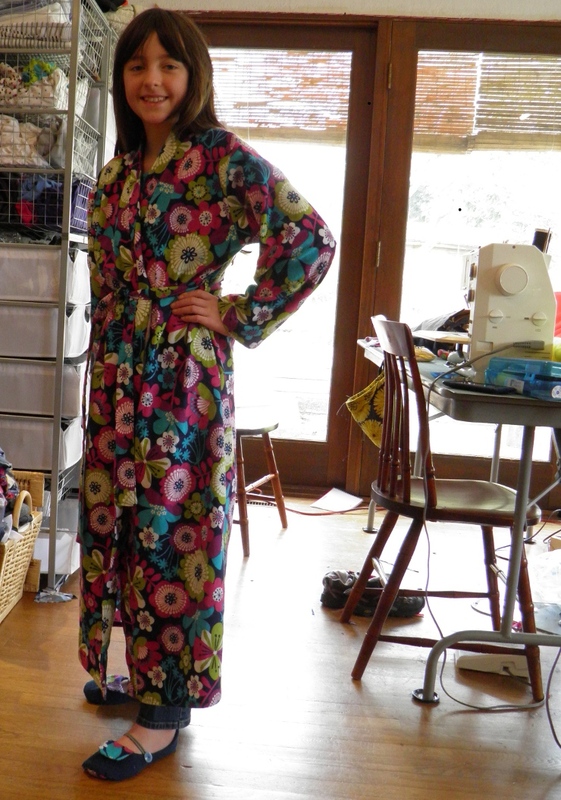 This week four young sewists worked on kimono-wrap style bathrobes and adorable little house slippers. It is a never-ending joy to watch how excited they get as their creations start coming together. And they are so proud to wear something they made with their own two hands! 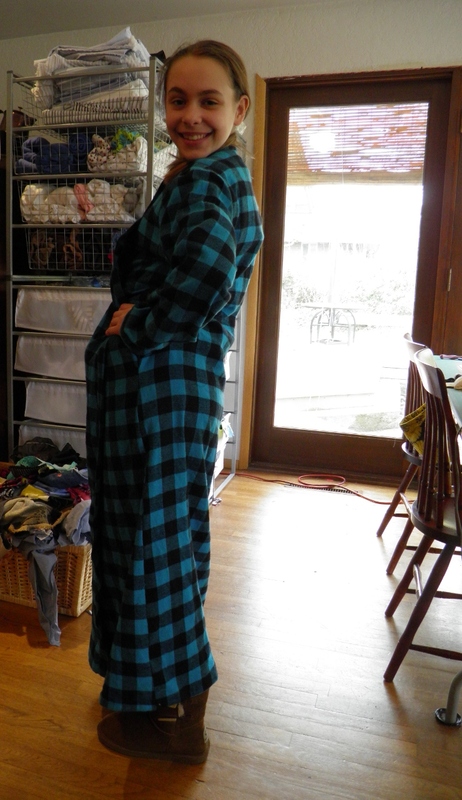 Love this floral print robe, and navy flannel slippers with a matching print toe cap. Nice work, O!! I am pretty sure someone is going to be extra-stylin’ at sixth grade camp this spring. Not to mention warm and cozy! 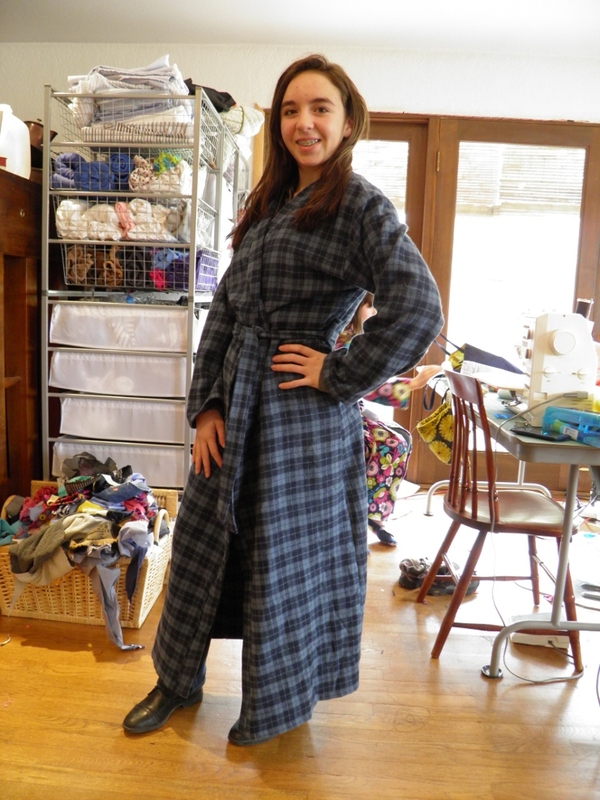 This very classic navy plaid fabric makes a super cute robe, don’t you think? 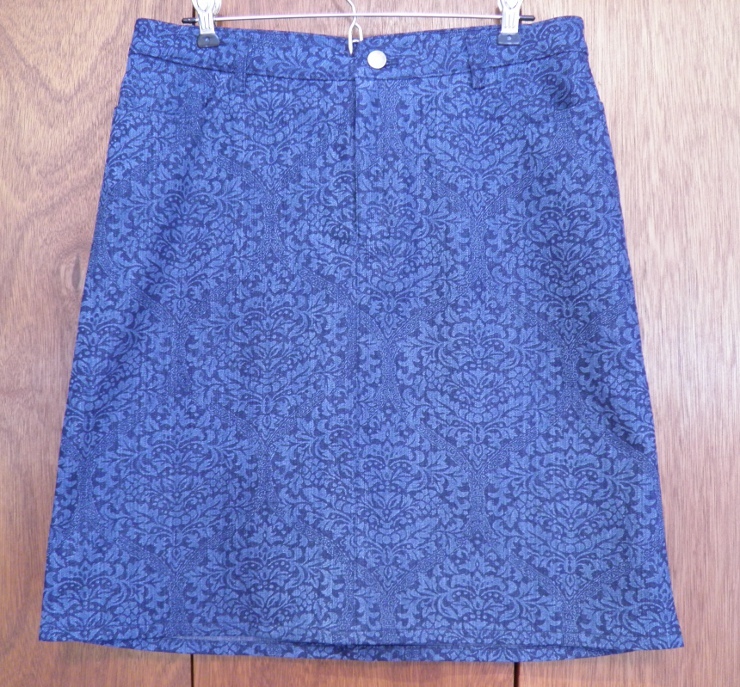 I made up this stinkin’ cute Style Arc Sally Jean skirt very shortly after Christmas, but somehow was unable to manage adding the buttonhole and attaching the jeans button fastener. I am not going to say it was because I ate too many Christmas cookies, and was unable to comfortably zip up the thing. Time. I just couldn’t find the time for these tasks. Same thing here for these Jalie 2908 (modified to straight leg) jeans – awaiting buttonhole and fastener for nearly 2 months. Size was not the problem. Inertia? I REALLY love this fabric. It is a Calvin Klein stretch denim that is a little dressier, almost a jean trousers look IMHO. Bought it last fall from Ashley at The District in Seattle. Nice stuff!! Notice I like to roll the cuffs on straight legs or skinnies, so I often don’t bother with a double-turned hem. Just serge and roll! Soooo I have worn these dark wash jeans before, but I decided that I wanted to straighten the bootcut leg. Just in time for the fall 2014 trend to start showing wide and bootcut trousers!! 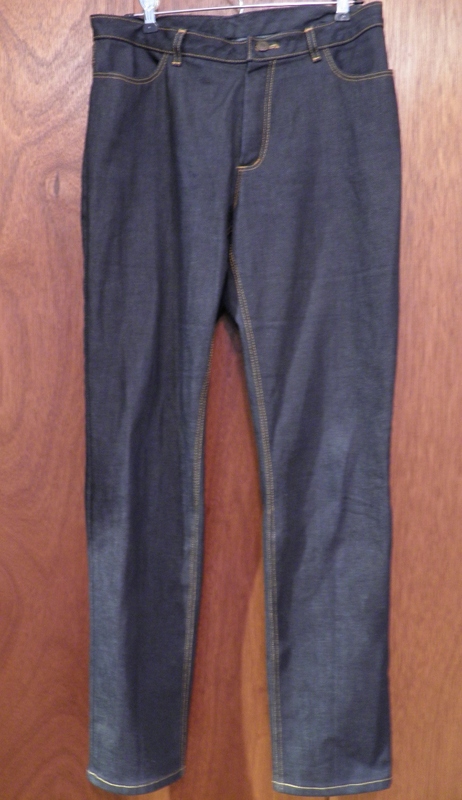 But since this denim is pretty firm, the bootcut looked more flared than it really was, so I decided to slim it a bit. That is one BIG. FAT. ANNOYING. alteration job. No wonder it took me a while to work up the enthusiasm. What’s on your sewing table today? I think a few knits are moving to the top of my queue next! I confess. I love to write on my clothes. It helps me align pattern pieces that do not have the same seam allowances, stitch straight lines when my machine stich plate guide is not accessible, match points on garments, and much more. My two favorite tools: Frixion pens and Chakoners! Do you write on your clothes? What is your favorite tool? If you know anything at all about me, you should know I love cardboard. Or more accurately, tagboard.This little miracle makes my sewing life so much easier, more professional,and very importantly, REPEATABLE. 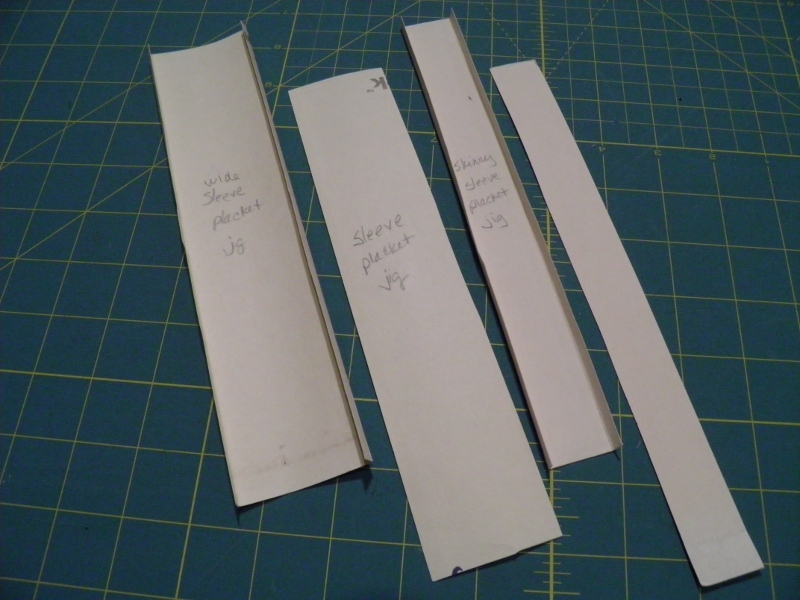 Get in the habit of making cardboard/tagboard templates in dimensions you use frequently, and then use them to accurately turn hems, shirt placket fronts, and more. Easy-peasy. 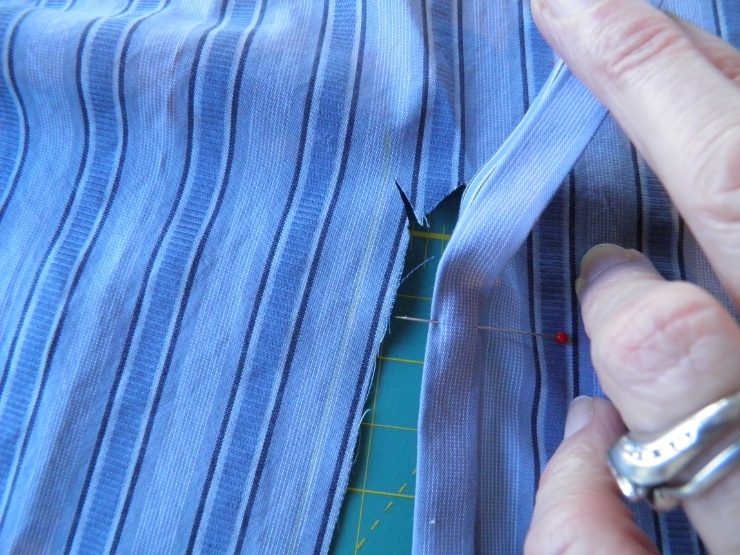 Today we are going to use a tagboard “jig” to help make stinkin’ simple shirt plackets. Cut 1 piece of tagboard 2.5 inches wide x at least 6 or 7 inches long. 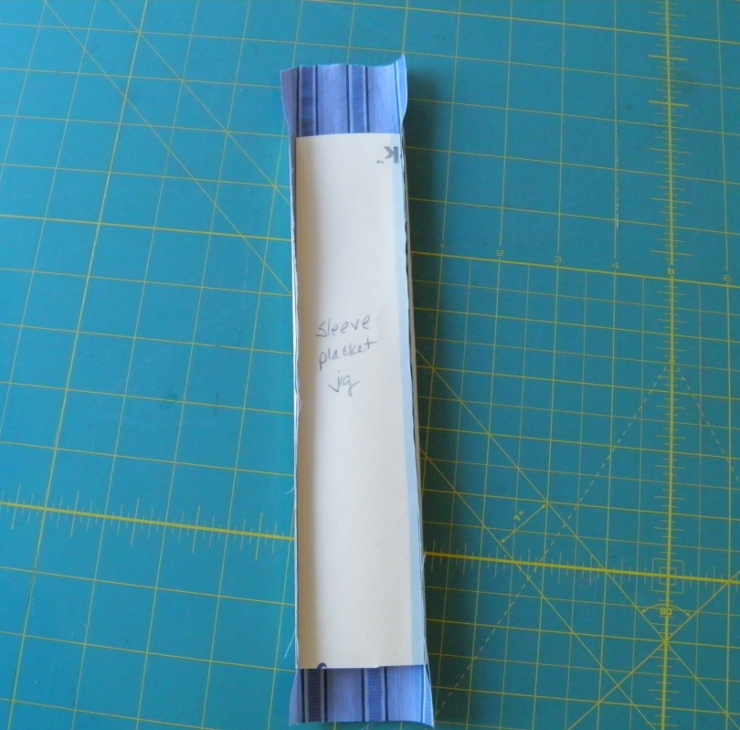 Along both long edges score a line 1/4 inch from the edge and fold toward the center. Cut 1 piece of tagboard 2 inches wide X at least 6 or 7 inches long. This piece should fit exactly inside the scored/folded piece. This is for the wide sleeve placket. 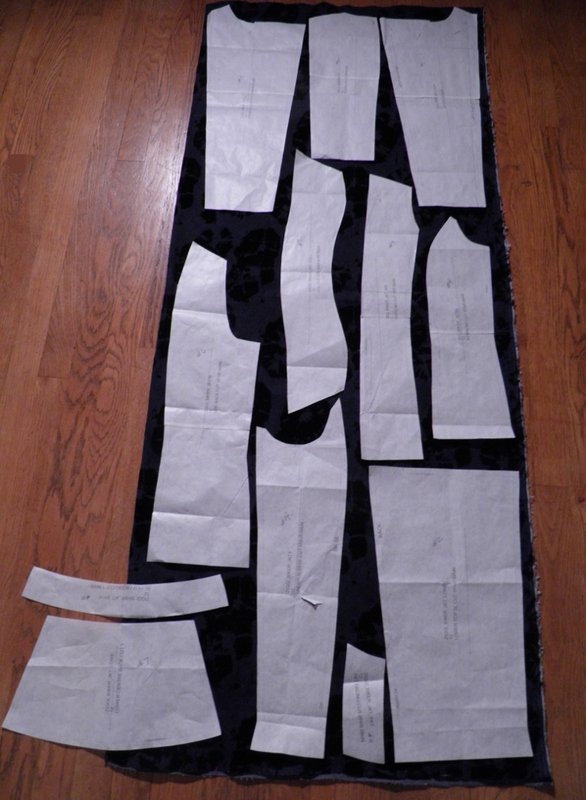 Repeat steps 1-3, but making the larger piece 1.5″ x 6 or 7 inches and the smaller insert 1 inch x at least 6 or 7 inches. 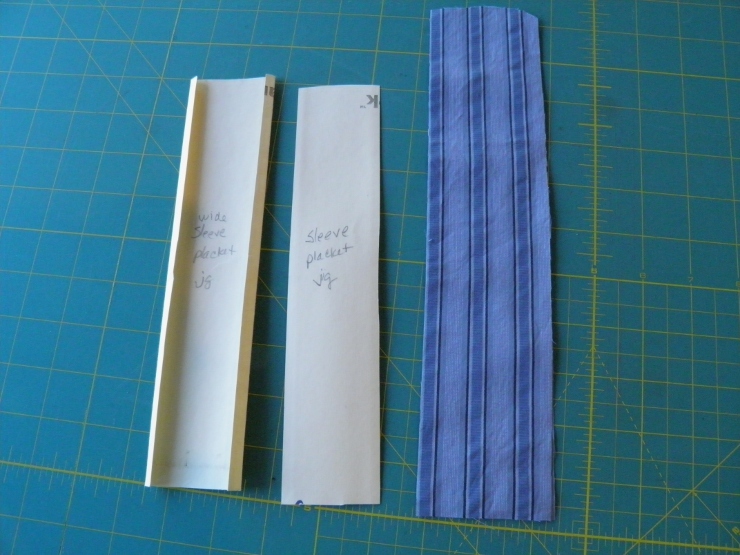 This is for the skinny sleeve placket. That’s it! Now you have the tool that will make perfect sleeve plackets EVERY TIME. And all you had to do was draw a few lines on some old manila file folders, and cut ’em out. Now let’s get to work on the actual sleeve plackets. 1. 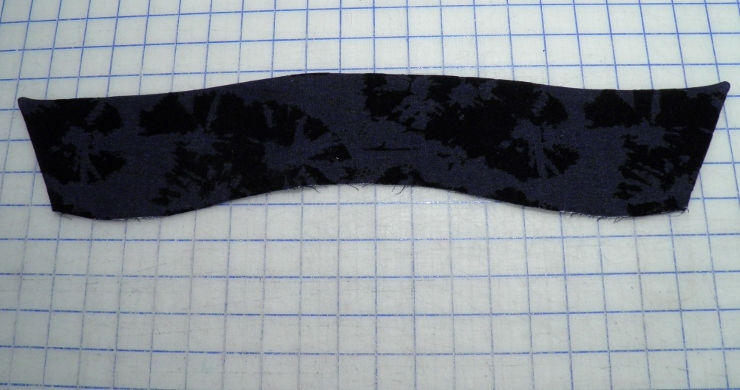 Mark line 6.5 inches long for the cutting line of the shirt placket. I hope you can see the yellow chalk line I drew on this fabric. 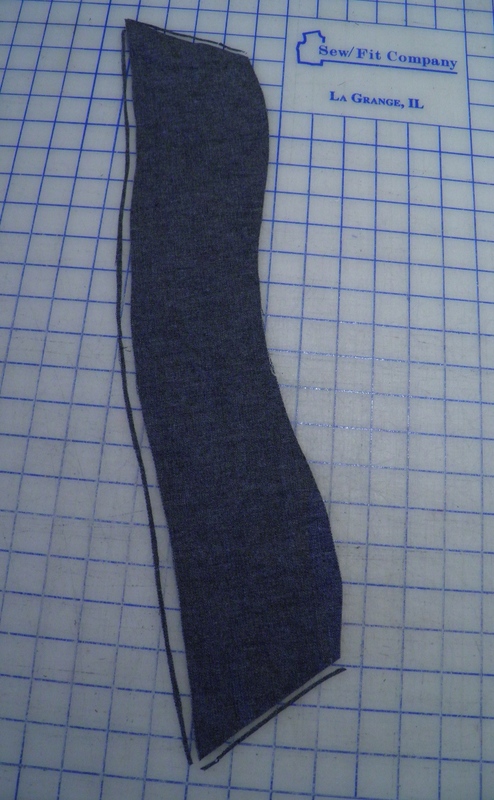 The tiny snip at the bottom of the sleeve is where the center cutting line is drawn. 2. Draw a line ¼ inch on either side of this “cutting” line, and a horizontal line at the top. Squint. The yellow lines are on either side of the center cutting line – which you can identify by the tiny snip. 3. Cut on center cutting line, forming small triangle at top. 4. 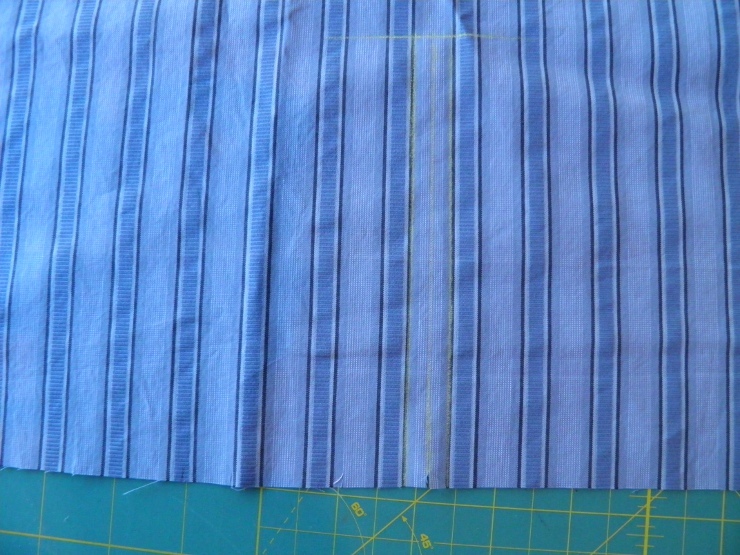 Cut a strip of fabric 2.5 x 8-9 inches for the wider placket. 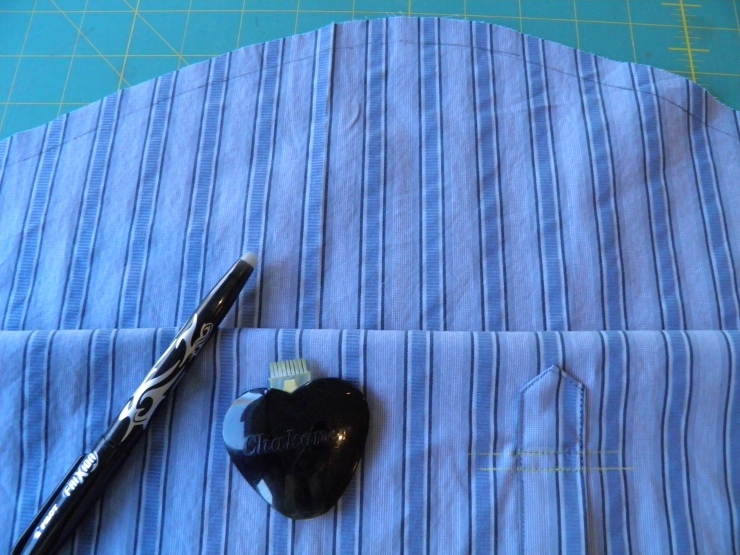 Put the fabric inside the “wide sleeve placket” jig, place the insert on top of the fabric, and press to create the “turn under” along both long edge. 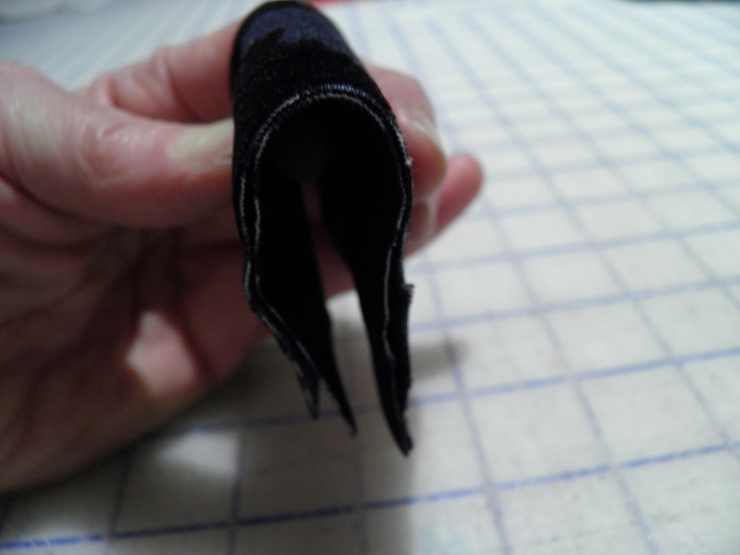 Then press in half to create a 1” wide large placket. Be sure to “favor” one side slightly when you press in half. 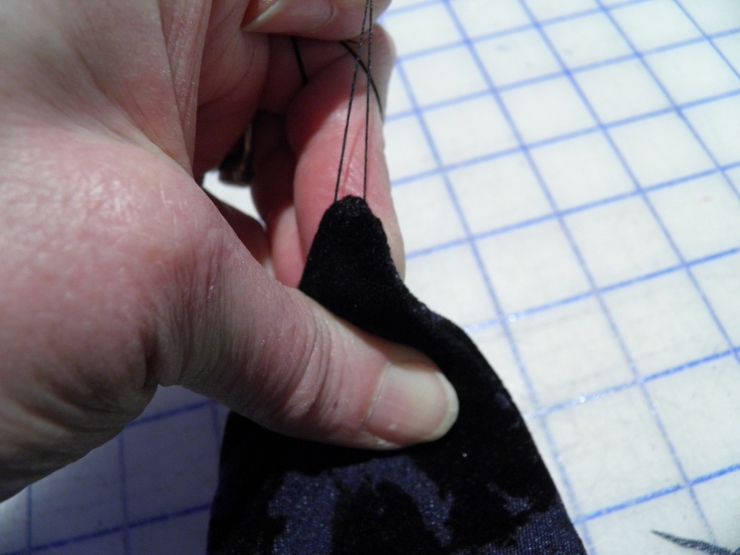 This will ensure your topstitching catches both the top and bottom of the placket. 5. 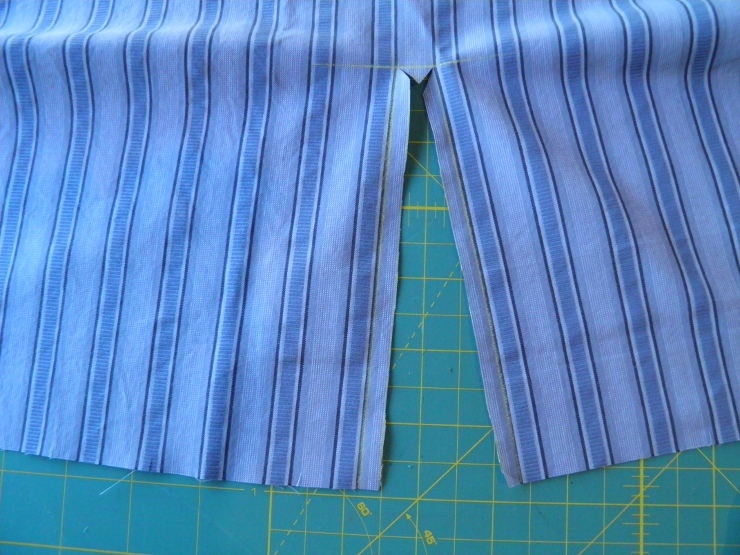 Cut a strip of fabric 1.5 x 6-7 inches for the “skinny” placket. 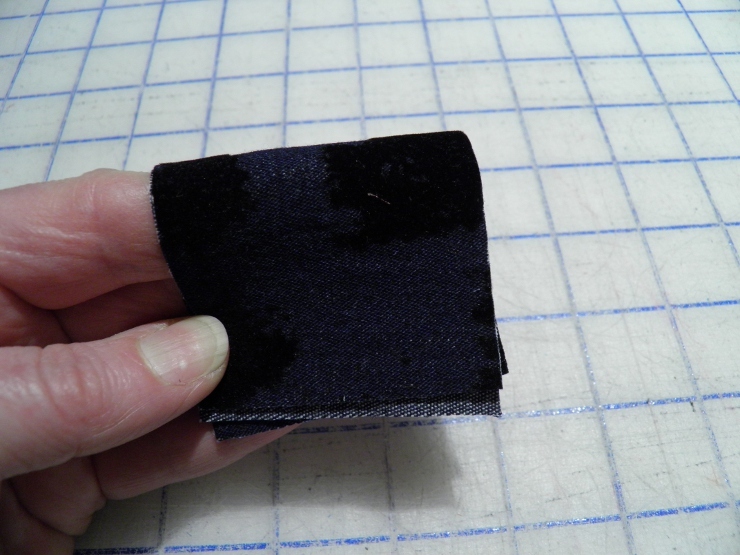 Using the small sleeve placket jig, repeat the step above and press to create a ½ inch wide skinny placket. 6. Slip cut edge into skinny placket, with the slightly shorter edge on top and the slightly wider edge underneath. Align the fold with the chalk line and pin in place. 7. Stitch up to the horizontal cross mark on sleeve, leaving triangle free. 9. 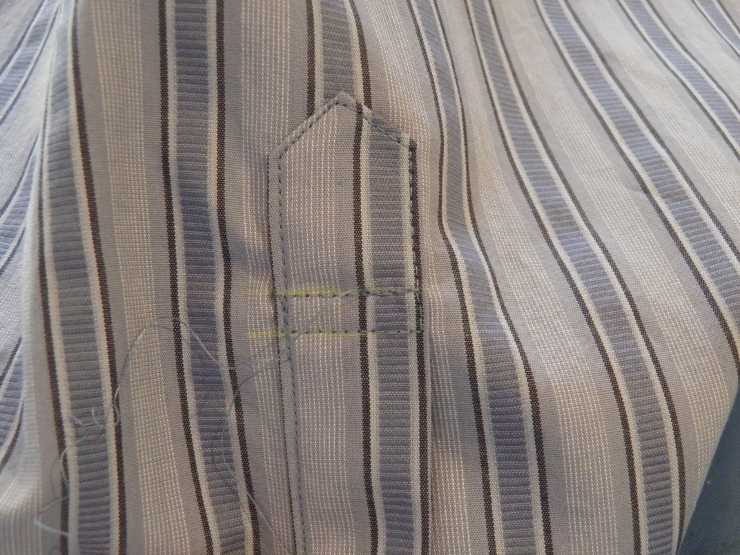 Slip wide placket onto other side of cut edge and edgestitch just up to the horizontal cross mark. 10. 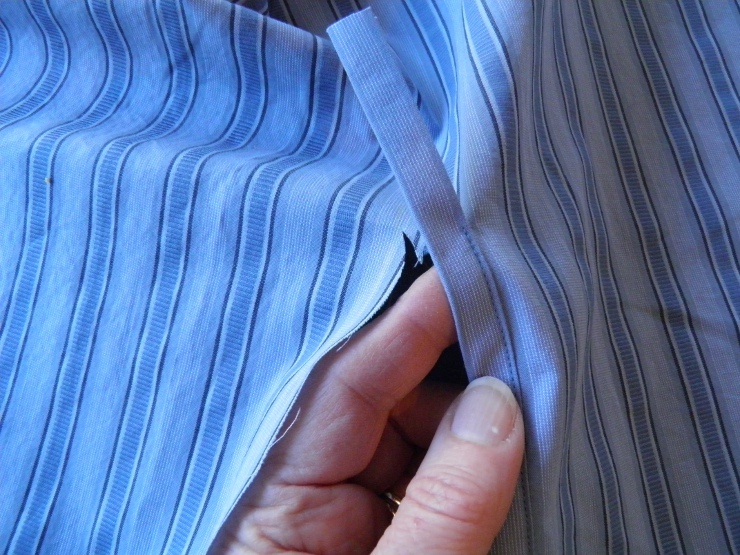 Lay the wide placket over the skinny placket, and fold it straight down on top of itself. 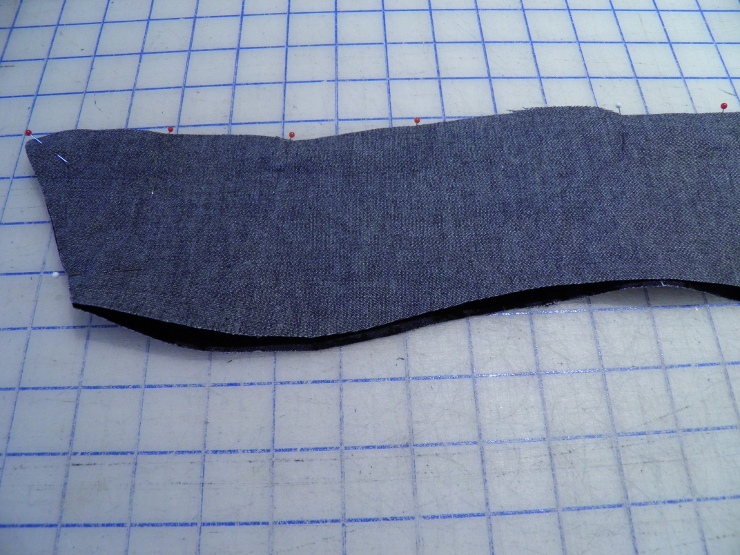 Next, fold the wide placket at a 45 degree (right) angle, and press well. 11. 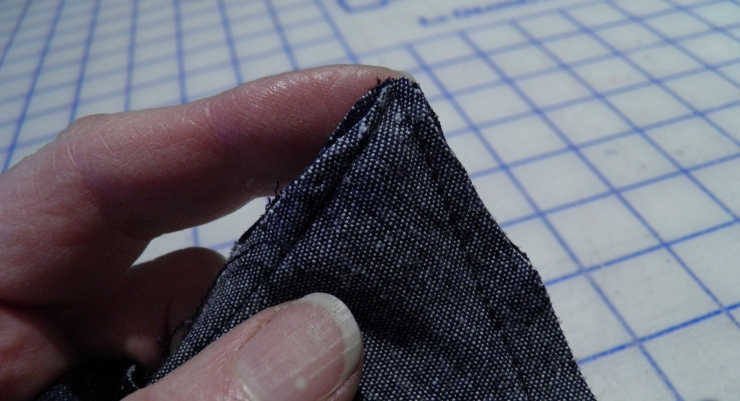 Now fold the wide placket back over itself at a 45 degree (right) angle and again press thoroughly. You should have a perfect triangle at this point! 12. Trim the excess bulk away from the triangle. 13. 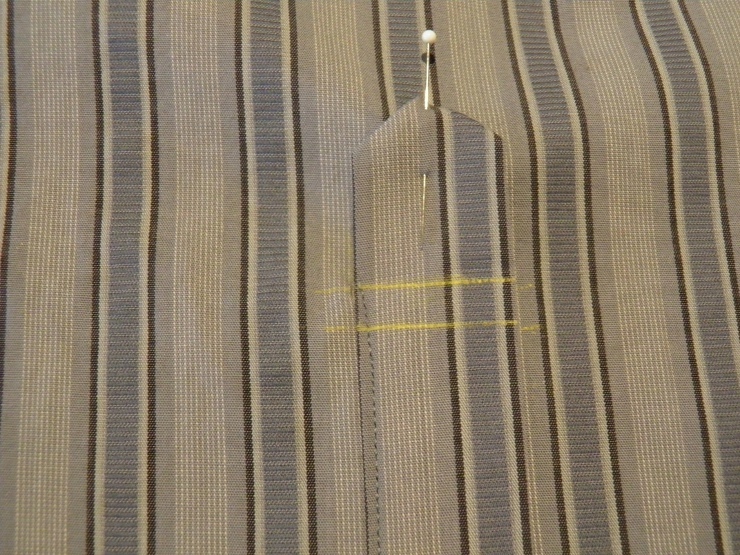 Pin the triangle in place, and mark 2 horizontal cross lines across the wide placket. Note: At this point you will be stitching on the wide placket, securing the small placket underneath with the final topstitching. 14. Stitch around the triangle through all layer: wide placket, skinny placket, sleeve. Be sure to backstitch, overstitch, or take a few stitches at 0 stitch length to secure this stitching. 15. If you did everything perfectly, on the underside of your sleeve one row of the horizontal topstitching will be on the small placket only and one will be on the larger placket. Doh! Oh well, next time it will be PERFECT, inside and out! Repeat these steps for the other sleeve. You will get faster with practice. Also, you can decide for yourself how long you want your plackets to be – you don’t need to use my measurements (6-7 inches) or what is called for on the pattern. Your preference! 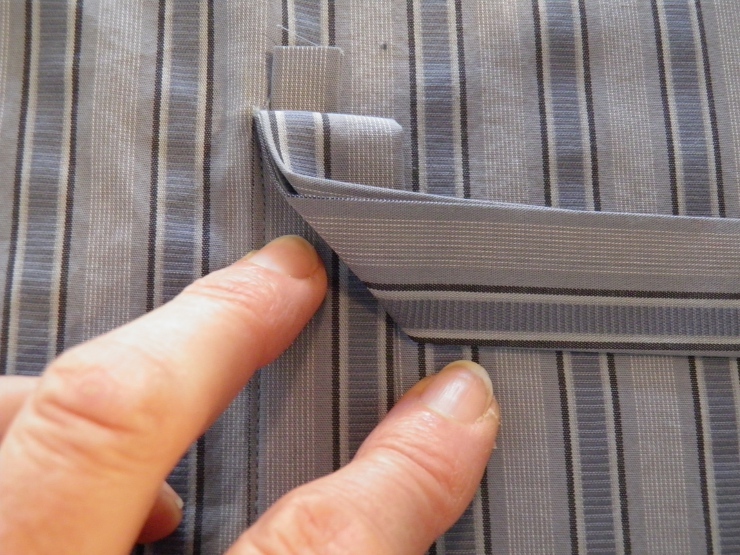 The only thing you should do is measure your second placket to make sure it is the exact same finished length as your first. Now go give this a try and tell me what you think! Have you ever tried stitching with cotton thread on cotton fabric? 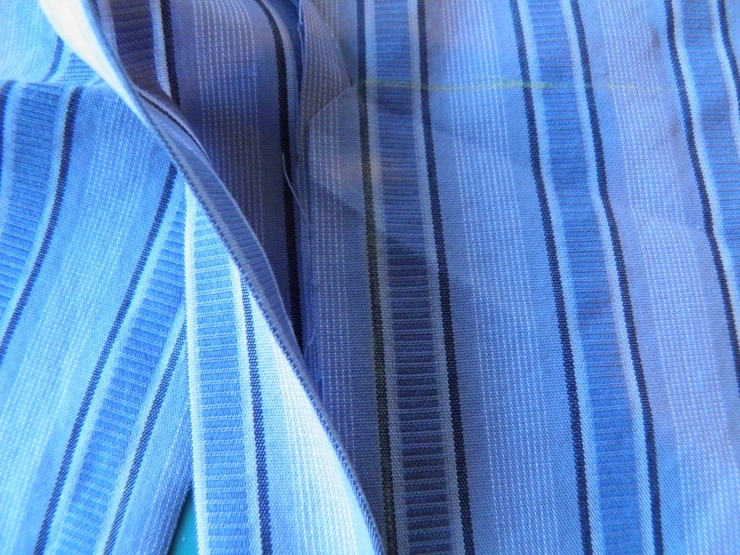 I love the way it “melds” into the 100% cotton shirting fabric I use for men’s dress shirts, and since the Italian-made Aurofil I use is a finer weight, it also makes lovely buttonholes. Use it the next time you are make a high-quality cotton garment, and let me know what you think.